The level of due diligence required by a landlord and tenant may be quite different from a seller and buyer. In a leasing scenario, typical due diligence may include the landlord reviewing the credit of tenants or the tenant finalizing costing for tenant improvements. We advise that these items be addressed prior to removing conditions on an offer. Similar to buying a home, pre-approval for funding required by the tenant or determining budget can sometimes be well established before the accepted offer stage. Finalizing of funding may be required and most landlords will permit a conditional period for the tenant to complete their process. It’s our job as agents to make sure our tenants are qualified before we present offers. It speaks to our integrity in dealing with landlords. Lease review is the most common step in leasing due diligence. The lease is prepared by the landlord and tenants are encouraged to seek legal counsel in reviewing the implications of signing off. In some sale scenarios, due diligence can often include a longer period of review than a lease transaction. Barry and I will sit down with clients interested in selling and lay out the items we advise they complete prior to listing. This can include paying for due diligence that a buyer will require. There are multiple reasons we may ask a seller to pay up front for due diligence. 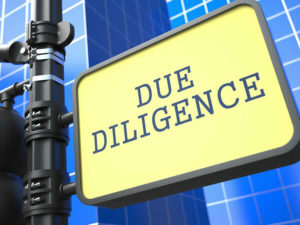 The most obvious logic is that due diligence prepared prior to an accepted offer can speed up the due diligence period. That said, a buyer may need reports completed that cannot be anticipated such as identifying possible environmental impacts like asbestos removal. In this case, a buyer will have to pay to find out the true extent of the situation they’re potentially inheriting. Reports such as this are not free and can involve weeks of preparation. A buyer needs to be prepared to invest a certain level of funding to the conditional period even on the off chance the deal does not go through. A seller completing due diligence prior to a sale rarely regrets the decision. Often the reports have a shelf life that will allow for a longer sale period. As well, the reports can shed a light on questions an owner may have suspected or have been curious about. Be it good or bad news for a potential sale. A buyer completing their homework on a property is investing in their decision wisely. Finding out costly consequences after a purchase is complete can be devastating. I’ve heard it said, you have to pay to play and the game of commercial real estate trading is very much a gamble. But talk about a pay off if it works out!